Having a radiator leak in your vehicle can be very frustrating. Leaking coolant can be difficult to identify and the leak location can remain a mystery even to the best mechanics. The problem with a coolant leak is that coolant usually doesn’t stay in the area of the leak like oil will. Coolant leaks also don’t always leave behind a trail of residue or road grime because coolant is not nearly as thick or sticky as engine oil. Since coolant drips easily and will dry quickly, you often need to find the source of the leak while your car is running. Let your vehicle idle in your driveway while it is warm and continue to look under your engine waiting for a drip. Once you find your drip location you can start to look for the actual leak. Start by looking straight up from the leak, or straight down on top of it from under the hood. Be careful as you are looking that you keep your hands clear from the engine fan and belts and be careful of hot surfaces. If the coolant drips are coming from the front of your engine bay it is likely that you have a leak from your radiator. Make sure you check around the large hoses at the top and bottom of your radiator to make sure it isn’t a hose that needs to be replaced causing the leak. 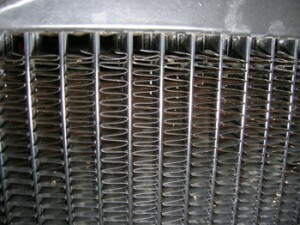 Leaks in your radiator can come form in the actual cooling area or in one of the end tanks. The cooling area is made up of thin tubes and fins to aid in heat transfer and the end tanks are connected to the end of the cooling core to carry the coolant in and out of the radiator. Leaks in the cooling core are usually too small to be able to see, but if the leak is coming from an end tank you often can see the crack or where it has separated from the core. Repairing a radiator on an old vehicle can be a relatively simple process. When radiators were made from brass or copper, you could simply braze or solder the radiator back together sealing the leak without having to replace the entire radiator. New radiators are made from aluminum or plastic and cannot be repaired in the same way. To patch aluminum from the outside you would need specially welding equipment, and plastic expands and contracts significantly with the temperature swings in your motor so it can also be very difficult to seal. Replacing your radiator is also an expensive ordeal. New radiators are expensive due to the materials they are made out. The labor to replace them is also expensive. Replacing a radiator will require new coolant, as well as a few hours of labor to remove the old radiator, install the new one without damaging the delicate fins, and then removing all the air pockets from the cooling system. BlueDevil has developed a product that can repair new aluminum and plastic radiators even more easily than old copper or brass radiators. BlueDevil Radiator and Block Sealer is a specially formulated sealing agent that can bond easily to plastic, aluminum, and even brass or copper. BlueDevil Radiator and Block Sealer is a chemical sealing agent that you pour into your radiator as a liquid. As your coolant heats up, BlueDevil Radiator and Block Sealer will react at the temperature differential caused by the leak to form a permanent chemical weld stopping your leak and repairing your radiator. I HAVE OLD TRUCK AND GUY USED PRESSURE TEST. SAW UPPER LEFT OF RADIATOR SIDE LEAKING AND ALSO HE SAID TIMING COVER. ANY HELP FOR THIS LIL TIGGER OF A GAL? I AM BUSTED FROM CRAP ALL THE TIME. HELP. Based on your description, we recommend using the BlueDevil Radiator & Block Sealer, found here on our website: http://store.gobdp.com/radiator-block-sealer-00205/ . As long as you are not losing water/coolant too quickly, you would be a good candidate for the product. Feel free to contact our technical support line at 888-863-0426 with any other questions. What about leaks from my freeze plugs. The BlueDevil Head Gasket Sealer, http://store.gobdp.com/head-gasket-sealer-38386/, would also seal leaking freeze plugs. Feel free to contact our technical support line at 888-863-0426 with any other questions. We have added you as a subscriber to our website mailing list. Feel free to contact our technical support line at 888-863-0426 with any questions.